Over the years, we have seen everything from Matchboxes to dolls to sports equipment to stuffed animals to toy construction equipment to games to bikes. No matter the size of the donation, all donations arrived with big feelings from the heart. Thank you to everyone that participated and donated! Thank you to the Marines overseeing Toys For Tots efforts in Baltimore County! The children that will receive each heartfelt gift thank you!! 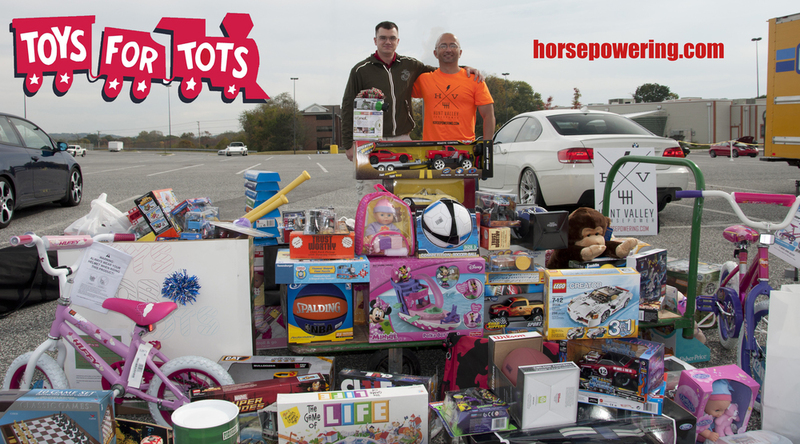 Our efforts have contributed to the #1 Toys For Tots program on the East Coast! Saturday, October 13, 2018 was a soaker nearly right up to the time of the event-capping photo. Because of the rain, it was the first time in 6 years where the donations were placed directly in the transport van instead of being displayed proudly on the event grounds. Our community took to the roads with what each considered their monsoon vehicle. Some donated and held it out through the rain. Others opted for the drive-through donation. All will make a great impact this holiday season. For a second-straight year, a big thank you goes to Bob Davidson Ford Lincoln for the 18-hour donation of the spectacular Ford Raptor 4x4 Supercrew. Thank you to each community member and sponsor for your donations! Of course, thank you to the Marines from the 4th Combat Engineering Battalion for their time and coordination efforts! The gathering on October 14, 2017 battled overnight rains and the morning mist but the community, the Marines, the Ford Raptor - courtesy of Bob Davidson Ford Lincoln - and even our koala mascot all rose to the occasion! For more information on Toys For Tots, click on the logo!